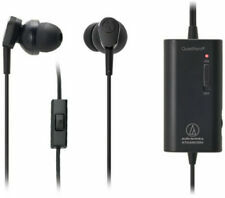 Audio-Technica QuietPoint 33 Active Noise-Cancelling In-Ear Headphones. This wave acts like a noise eraser: it cancels out the annoying sounds that surround you without diminishing the audio you want to hear. The headphones are also IPX5 Waterproof Certified , so you can wash them off when your workout is through. Format: HEADPHONES, Black,IN-EAR Headphones,Bluetooth. Communication System: Bluetooth Version 4.1. Wireless Technology: Bluetooth. SonicSport Wireless In-ear Headphones. Sound Mode: Stereo. Sound Pressure Level: 93 dB. Limited Warranty: 2 Year ". Protective Pouch. 30 cm (1') USB Charging Cable. Weight (Approximate): 0.91 oz. The headphones are IPX5 Waterproof Certified , so you can wash them off when your workout is through. Format: HEADPHONES, Black,IN-EAR Headphones,Bluetooth. Communication System: Bluetooth Version 4.1. The 1.2 m (3. A convenient carrying pouch is also included. Format: HEADPHONES, White,With Microphone,Earbuds,IN-EAR Headphones. Cable 1.2 m (3. Bass Venting System provides excellent air damping. Blu-ray and DVD Region Codes. ). Earpiece Design: Earbud. Earpiece Design: Over-the-ear. Earpiece Type: Binaural. Microphone Design: On-cable. Cable Length: 3.90 ft. The two 8.8 mm drivers are serially situated within each housing and driven simultaneously to reduce diaphragm distortion and generate a balanced sound with deep, rounded bass and clear mid and high frequencies. Audio Technica ATH-ANC33IS Quietpoint Active Noise-Cancelling In-Ear Headphones Black [New Headphone] Black, With Microphone, Earbuds, In-Ear, Noise Cancelling. This wave acts like a noise eraser: it cancels out the annoying sounds that surround you without diminishing the audio you want to hear. The Audio Technica ATH-SPORT70BT. 9 mm performance-enhanced, carbon-coated drivers for amazing wireless audio. Battery Life Up to 6 hours. Ear-hook design provides a secure fit for active use. Sensitivity (Microphone) -42 dB (1V/Pa at 1 kHz). Each housing contains one mid-frequency and one high-frequency driver, along with two low-frequency drivers, resulting in incredibly well-balanced sound across the entire frequency range, and including strong, fully realized bass. Designed especially for active use, the ATH-SPORT1 SonicSport in-ear sport headphones have a hinged ear hook that pivots to provide a custom fit around the ears for secure, long-lasting comfort, even during a vigorous workout. The two 8.8 mm drivers are serially situated within each housing and driven simultaneously to reduce diaphragm distortion and generate a balanced sound with deep, rounded bass and clear mid and high frequencies. The headphones are also IPX5 Waterproof Certified , so you can wash them off when your workout is through. Format: HEADPHONES, Yellow,IN-EAR Headphones,Bluetooth. Communication System: Bluetooth Version 4.1. The headphones are also IPX5 Waterproof Certified , so you can wash them off when your workout is through. Format: HEADPHONES, Pink,IN-EAR Headphones,Bluetooth. Communication System: Bluetooth Version 4.1. Earpiece Design: Earbud. Earpiece Design: Over-the-ear. Earpiece Type: Binaural. Microphone Design: On-cable. Cable Length: 3.90 ft. The armature drivers combine both a super tweeter driver and a full-range driver to produce extended high frequencies along with fully fleshed tones in the mid to low frequencies. We also verify that the serial number and UPC match the original invoice, and any item that does not match will not be accepted. You may also be interested in. If, for any reason, you are not satisfied, we will work with you to make it right. The headphones are IPX5 Waterproof Certified , so you can wash them off when your workout is through. Format: HEADPHONES, Pink,IN-EAR Headphones,Bluetooth. Communication System: Bluetooth Version 4.1. Electronics:Japan Usage Item. The color of the actual products may be slightly different from that of the images on this web site. Condition : New. Designed especially for active use, the ATH-SPORT1iS SonicSport in-ear sports headphones combines all the features of the ATH-SPORT1 with smartphone capabilities. Like the ATH-SPORT1, the hinged ear hooks pivot to provide a custom fit for secure, long-lasting comfort. The headphones are also IPX5 Waterproof Certified , so you can wash them off when your workout is through. Format: HEADPHONES, Blue,IN-EAR Headphones,Bluetooth. Communication System: Bluetooth Version 4.1. This wave acts like a noise eraser: it cancels out the annoying sounds that surround you without diminishing the audio you want to hear. The result.a peaceful enclave to enjoy the music or movies of your choice. Give your workout everything you got – the ATH-SPORT3 SonicSport in-ear sports headphones are designed to stay with you – and provide a musical boost – every step of the way. And the headphones are IPX5 Waterproof Certified , so they can be washed when your workout is through. Wireless Technology: Bluetooth. The headphones are IPX5 Waterproof Certified, so you can wash them off when your workout is through. The internal lithium p. Sound Mode: Stereo. Sound Pressure Level: 93 dB. Standard MMCX connectors 5N 8 Core silver plated cable. It has a vent on the round faceplate and another on the lower portion of the nozzle, unlike other earphone, the vent on this TIN T2 earphone has real useful adjust sound function, do not work as decoration on the earphone.